Frank Peretti books are always discounted at Schoolhouse Publishing! With more than 12 million novels in print, Frank Peretti is nothing short of a publishing phenomenon and has been called "America's hottest Christian novelist." Peretti is the author of 21 titles, including the international bestsellers This Present Darkness, as well as numerous children's books. Frank Peretti's two spiritual warfare novels, This Present Darkness (1988) and Piercing the Darkness (1989), captivated readers, together selling more than 3.5 million copies. His Christian novel The Oath (1995) has sold over a million copies and was awarded the 1996 ECPA Gold Medallion Award for best fiction. 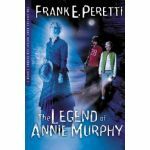 Frank Peretti's novels are favorites among my kids. My sons have enjoyed Monster and Oath (which my oldest son has chosen as his all-time favorite novel). All of my kids have enjoyed the Veritas Project series and the Cooper Kids Adventures. Browse through this section for on-the-edge-of-your-seat Christian fiction drama for the entire family.